I received an error message of "The browser or gateway element with ID 'Safari1Plus' cannot be found." and a description of "An error occurred during the processing of a configuration file required to service this request. Please review the specific error details below and modify your configuration file appropriately." 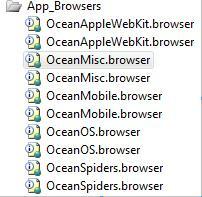 This is because the browser definitions that were (appreciatively) borrowed from Ocean's Place are inheriting from definitions that existed on the .NET framework v2 and no longer exist on v4. Through personal preference I decided to remove the 3rd party definitions as I would assume .NET4 has covered the new browsers/crawlers missed by the 5 year old .NET2 by now. Replacing all the new definitions with the old ones worries me as we’d getting out of sync with the expectations of the framework, which will affect service pack updates to these definitions. I am afraid to say that the new definitions in .Net4 are even worse at identifying bots, and older browsers. They removed support for older browsers, and mobile devices in this beta. It will identify IE,Firefox,Safari,Iphone,Blackberry's, and a few others but that pretty much some up what it will detect currently in the build I downloaded yesterday. Thanks Ocean for the (bad) news ;) I have done some testing since I wrote this post and you're right: MS's new definitions fall way (way way) short of the level of detail that you put into your definitions (for .NET 2). I noticed on your site that .NET4 definitions are on way. Can't wait. Let me know when they are available, I'd like to write a post about them.